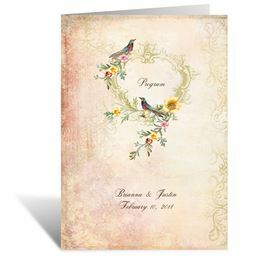 Vintage florals and flourishes in a gorgeous, sunset color palette form an extraordinary setting for two birds to perch on this beautiful wedding program. The two inside panels of this folding program allow plenty of room for personalizing with your wedding details. Your wording is printed in your choice of colors and fonts. Program is printed on ecru stock. I ordered these programs to match my wedding invitations. They are as spectacular in beauty and quality as the invitations. The only problem I had was with the website when I had typed in my information two different times and the information showed "saved" but then was not there. This was extremely time consuming and frustrating but the programs themselves are top-notch. Not only are the cards stunning the customer service is second to none. Would only recommend in rains by dawn. I promise you won't be disappointed. Great team !!! Gorgeous colors, just like the images online showed. I asked to have things moved a bit outside the grid of how they are set up on. The customer service person was very helpful and made it look just how I asked. I am absolutely in love with how the programs came out, they are much nicer in person and on excellent stock! The process is a little tricky of how the text will lay out from page to page so I did have to call twice for help and I can say that the phone service was nothing short of outstanding. Helpful, kind and patient and voila, a beautiful product and experience all around. I highly recommend this program to anyone who is looking for a more vintage feel for their big day.